You have two more days to get BLACK-EYED peas for New Year’s day eating!! In the South it’s a TRADITION. You must eat black-eyed peas on New Year’s day for good luck. I bought mine a few weeks ago so I wouldn’t forget. If I was awesome, I would have fresh ones. Mmmmm. My Mom makes the best, fresh black-eyed peas. Some people hate them and think they taste like dirt. I love their taste. Whip up a pan of corn bread and you are SET! I’ve seen dips made with them also that would be a great alternative if you can’t eat them plain! What traditions do you have for New Year’s? I’d LOVE to hear about them! P.S. Guess what? January 3rd I will announce a new giveaway! Yaaaaaaaaay!!! Happy END of DECEMBER friends! Oh my gravy! Last week of the YEAR 2011!! Whooohooooo! I’m busy working on new things for Easie Peasie this week. I want everything to be in line for the new year next week. The biggest thing…I’m combining my blog and photography/design company. I have 3 Facebook pages, 2 blogs and 3 email accounts. It’s total INSANITY keeping up with it all. And I am D.O.N.E. with all that craziness. After this week all photo session sneak peeks and design goodies will be posted here. I will no longer even use my Easie Peasie Photography & Design Co. Facebook page. Everything will be under Easie Peasie. I can already feel the relief. My company is a big part of my life, and I don’t know why I thought I needed to separate that from Easie Peasie the blog. I’m so silly sometimes. So…get ready for lot’s of photo fun, business ideas and design goodies on top of all our blog fun! Another change that I’m sure you have already noticed is the look of Easie Peasie. The swallow is my new logo and will be for all things Easie Peasie. I’ll go into more details on that later in the week. I’m so super excited about the changes…and how much simpler my life will be because of them! YAY! So let’s talk Christmas. I am so so so glad it’s over. I loved every second of it. But I’m glad it’s on to the new year now. We had such a BLESSED Christmas. More blessings than I am worthy or deserving of for sure. And I won’t go on an on about what we got for our Christmas goodies. But there are a few things…I’m TOTALLY LOVING!!! I am now a Sperry shoe convert. Bath & Body Works Be Enchanted smellies. I can’t stop spraying it! One of my favorite handmade gifts was a cross my Step-Sister Mandy made me. Oh. My. Goodness. Love it! It’s SO SPECIAL!!! It goes PERFECT on my faith/cross wall! I made this FAITH sign the other day too! I made it with an old piece of wood, vintage buttons from an estate sale, vintage glass beads from the thrift store, old book pages and scrapbook paper. Love it! Hope you are enjoying your last week of the year!!! Love, hugs and SHAG RUGS! It’s almost here. My goodness gracious. Christmas 2011 is right around the corner. I’m loving every second of it. We have had the best week, full of simple and sweet things. My Jaxy, myself and my sweet parents went to the movies yesterday. It was Jaxon’s first ever trip to the movies. He did so awesome! Can you guess which movie we went to see? “We Bought a Zoo.” And we loved it. Jaxon loved the animals and kept yelling out the types of animals as they flashed across the screen. He knows what lemurs are and when they mentioned them he kept asking ((out loud)) where they were? Ha ha. Super sweet movie. ♥1--drink coffee with my mug-snuggie my Mom made for me. Don’t you love it? It takes coffee-drinking in the morning to a whole new level of warm-comfort-love. Aaaaaah. In love with it. ♥2--Make reindeer food for Jaxon to put out tonight. He’s going to be ecstatic! Need the recipe? Click the picture! ♥3--make cookies to set out for Santa tonight. I bought pre-made sugar cookies with colored tubes of icing for Jax to decorate with. FUN! ♥4--wrap Jaxon’s gifts. I keep forgetting to wrap them! Oh gosh! Someone remind me that TODAY is my LAST day! ♥--RELAX and revel in the beauty of the day. I can’t wait to see Jaxon’s excitement in the morning. We have had a truly blessed Christmas season. We kept things so simple, yet we had such a great month. Blessings abound in every aspect of my life. I won’t be blogging for a few days to celebrate Christmas and to take a virtual break. I know you too will be hugging your loved ones, eating yummy food and reveling in your own blessings. May you be blessed this Christmas. May you feel God’s love in all that you do. The Head & Shoulders give away ends TODAY! If you haven’t done so already, swing by this POST, read my review of the latest Head & Shoulders product and leave a comment to be entered into the $50 Visa gift card giveaway courtesy of BlogHer. The contest ends today at 5:00 PST!! How’s your week going??? It’s almost Christmas. What in the world?? This little guy is getting SO EXCITED! He told me this morning that we need to go to the store, so he can get a long train. Ha ha. Little stinker. Hope your Thursday is awesome!!! As Christmas approaches, I seem to be slowing down. Perhaps its from the rapid pace I’ve been functioning at for the last few months, or maybe it’s because I actually have a few moments of quiet time lately. Whatever it is. It’s nice. Just reveling in the moments of peace and quiet. And the simple things. She called and asked if Jax and I wanted to come eat fried chicken with them. I don’t think I’ve eaten her chicken in like 10 years…It’s been ages. It was soooooooo good. And so awesome just to help make dinner with her and enjoy the moment with my parents. As I was picking out pictures for this post…I had to laugh. This one with my Mom making the chicken is hilarious. Look right below the Zip-lock bag on the cutting board. Yep…Jaxon’s toys. Ha ha ha ha. They are always…every where! Especially where you least expect them! She makes all of us individual little pies. Isn’t it precious? With homemade French cream cheese pie crust. She’s amazing. Hope you had a great weekend. We sure did! I am flat tired. Are you? I think after I finished finals my brain automatically shut down. All in…all done. Ha ha ha! Here’s a few photos of what we were up to the past few days. We did our annual hayrides at our church to look at Christmas lights last night. It was so much fun. In addition to the hayrides, they serve free hot dogs, hot cocoa, kettle corn and cotton candy to the entire community. It’s such an awesome family event. We always have the best time and the older Jax gets, the more fun we have. Jaxon LOVED it. We had to go TWO rounds because he loved it so much. And he would have gone THREE times but it was too late…and TOO COLD! There are some really awesome light displays. I saw some great crafty ideas too! Ha ha! Maybe next year I will remember them for projects. Here’s a few photos from this weekend’s sessions and a few from my Mustang session from awhile back that I worked on this weekend. I’m also in the process of re-doing my website. Seriously…NOT FUN! It’s like watching grass grow. It’s a very slow process. Uploading your entire work portfolio is a tedious process. I’m excited about the changes and in the end it will be SO WORTH it. But right now…it’s not looking like there’s any light at the end of the tunnel. LOL! I’m re-doing the blog design to match it as well…HOPEFULLY! I told my Mom for Christmas, I would like a maid and an assistant who can do Photoshop, HTML coding and web design. She laughed and said that’s probably not happening! GOSH!! Guess I’m stuck with all the dirty work! Ha ha! By the time school starts up again next semester…I might be cross eyed and under a pile of laundry. Juuuuuust kidding! Hope you had a BLESSED Monday! Hope your week was MARVELOUS! We are doing MUCHOS better…and hopefully my little computer will be BETTER as well. Do you want to read a little crafty-Christmas-colorful inspiration today? I’m pretty much completely SMITTEN with all things by Amy Powers. Click the picture to read the free magazine. Grab a cup of coffee and ENJOY! You will devour each page…I just know it! I adore her! Check her BLOG out by clicking HERE. 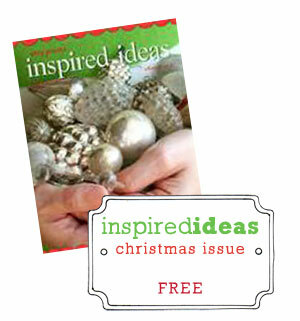 You can also find additional issues of Inspired Ideas there too. We have had a little glitch in our Christmas post schedule and will be back and rolling Thursday! My laptop has decided to come down with a cold this week! LOL. It’s not really funny though ---- I have my last day of finals today! It’s always something isn’t it? Ha ha! Here’s a teaser of what we’ve been up to…..
Can’t wait to catch up with you tomorrow! I'm so in love with this song. It's a great meditation to start your day with. I thought it would be perfect to share with you on a December Sunday. Today in your quiet moments of soul time may the lyrics soothe your heart and prepare you for another week. Happy Saturday to you! Hope your weekend is off to a great start. I don’t know why I’m on a recipe kick lately but I wanted to share another food goodie today. I had never heard of German Pancakes until last year. I read about them on a food blog and then researched the recipes of different ones. I had to try them out. They are sooooo good. And they are cheap, anyone usually has the ingredients on hand and they are SUPER easy. I love pancake breakfasts, but I don’t like standing over a hot griddle for 20 minutes to cook them. Yuck and boring. And for just Jaxon and I --- it’s kind of silly to do. So these are the perfect alternative. They take about 5 minutes to make and 25 minutes to bake. Super easy! I love making them on Saturday mornings. And you know my Jaxy loves to help make them too! I don’t know why they are called pancakes, because they don’t have the same texture. I think it’s better. They are like a fancy pastry. See all the flaky goodness. YUMMO! You can serve them with honey, agave nectar or syrup. We’ve had them with all three. They would be really great to experiment with and add various ingredients. For now, we love them with syrup drizzled over them. I added them for the Christmas features because I thought they would be a super easy, cheap and fast breakfast for your houseguests. They are so delicious, they taste like a gourmet entrée and your guests would never know how simple they really are! Oh. My. Goodness. It is Friday. Today is my last day of normal classes. I have a 20 page fictional narrative due tonight. The rest I have finished. Then next week it’s finals. I am almost dooooooone. And wouldn’t you know, I’m sick as dog at the moment. What in the heck? I did post a yummo picture on the EP facebook last night. It was so good I had to share! I try to be open to different recipes, but sometimes cringe. I don’t like funky food with funky ingredients. I can’t help it. And weird meat recipes really gross me out. But this I had to try. We have never had this before and it was so good! I thought it would be a great meal for the holidays. Your family will LOVE it! The PLUS side: the meat is so tender it’s like a roast. And compared to the price of a roast, round steak is about half the cost. WOW! I love making roasts on the weekends but sometimes it seems a little to high for my budget. This we could have all the time. Yay! It’s such a good comfort food. And I have to tell you something else. I hate bell peppers. Grody. If I eat fajitas, I pick out all the bell peppers and onions. Yeppers. I’m that girl. But the flavor the bell pepper adds to this dish is just the best! I actually ate and enjoyed the bell peppers!! I found the original recipe in my “Fix-It and Forget-It: Our Best Slow-Cooker Recipes 2011” cookbook. But changed it up for what I had on hand and wanted to make it with. You can change yours up too. I’ve seen other recipes that use carrots and celery, so based on your taste you can mix your veggies. After making this, it tastes so good that I would rather have this than a roast. And now that I know what a frugal, delicious meal it can be, we will be having it more frequently in our casa! It could actually be a delicious Christmas meal to change up the traditional holiday menu this year! Happy Thursday! My goodness – hope you’ve had a marvelous week! Today I thought I would share an oldie but goodie with you as a Christmas treat idea that you can keep and munch on yourself or share with friends, neighbors and family. I blogged this last year, but it’s been pretty popular with almost 2,000 hits this week. Isn’t that just wild. Wowzers! I wanted to make sure and share it this year again! Is is SUPER YUMMO and you will LOVE it! It’s a tradition at our house now! Check out how to make your own by clicking HERE.